The Russian Federation has become the largest supplier of military equipment to Latin American countries, overtaking the United States of America between 2008 and 2009. 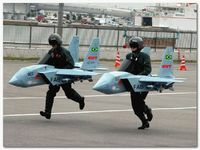 However, is Uncle Sam interfering with Brazil’s military modernization program? If the Brazilian Air Force has declared it prefers the Sukhoi SU-35 BM, why is Brasilia pondering other alternatives? Arms sales provide security and protection for the customer while joint projects create jobs and stimulate the economies of the buyer and seller. For the seller, maintenance contracts and training provide a welcome open door to further strengthening of economic and cultural ties further downstream. Latin America is no longer Washington’s playground. In fact, it is nobody’s playground. Sensible and socially progressive governments have swept the US-backed Fascist murdering oligarchies out of power in most of the continent, where Moscow has always been respected by the people as a friend and an ally. Therefore with the wave of People Power that has recently swept across the continent, it comes as no surprise that Governments which are no longer bullied by their northerly neighbour should turn to Moscow for superior equipment at better and more flexible prices. Venezuela, Brazil and Peru have been the main buyers of Russian equipment, followed by Columbia and Mexico, while Argentina is said to be considering Moscow’s interesting terms of payment and for 2010, Bolivia, Uruguay and Ecuador are currently negotiating deals. In 2009, the Russian Federation was the world’s second largest supplier of weaponry after the USA and in the Latin American region, its arms sales totalled over 5.4 billion USD after growing by 900 per cent from 2004 to 2009. Venezuela alone accounted for 4 billion USD, around half of this being converted into deals which give Russian enterprises shares in Venezuelan oil and gas fields. Regarding Brazil, the government of this awakened giant sensibly places the priority on contracts which place the emphasis on a joint approach which helps the country to develop its own arms industry through manufacture and technology transfer deals. What is strange in Brazil is the fact that Pravda.Ru sources have indicated that the vast majority of the FAB (Brazilian Air Force) pilots and strategists favour investment in Russia’s fantastic platform of airborne equipment, such as the light super-fighter Yakovlev YAK-130, excellent for training programs and patrol operations with its lower purchase and maintenance costs. Also, the Sukhoi T-50 is the only Fifth-generation fighter that can be compared to the US F-22 Raptor. And why was the Sukhoi SU-35BM, which the FAB preferred, excluded from the Brazilian FX-2 Program? What is the Chief of the FAB Brigadier Junio Sato playing at? Why in his FX-2 re-equipment program for the Brazilian Air Force is he toying with the Swedish Gripen and the French Rafale aircraft? Is someone influencing Brazil not to buy Russian equipment? And what is Junio Sato to state next, that the Sukhoi does not correspond to the norms and procedures of the Brazilian Government?